A VISION OF THE FUTURE. COLLATERAL WINS BIG WITH PHILIPS. Philips the electronics major in India has managed to be a part of the local fabric owing to the fact that they have been present in India for a major part, post Independence. In fact, there are two generations of Indians who have grown up using at least one or two Philips products, be it a radio or the simple bulb. In India, Philips made major inroads by reaching out to the masses through their Bulbs and Radios. There was a time when the radio was all important and was the window to the world. This was before the advent of television. People of all age groups were glued to the radio transistors to listen to the latest happenings from the world over. So ingrained was the brand in the Indian physic that the Philips word mark had become a visual icon, even the unread or the unlettered could look at the word mark and recognise it as Philips. That was the power and the reach of the brand. Cut to early nineties, post the liberalisation India was open to the whole world, and we saw a lot of MNC brands making a beeline to enter into India. India was touted as the Asian Tiger. The population studies had forecasted that it would be the world youngest population under the age of 35 in the years to come. This indeed was a lucrative market for the MNCs. The nineties also saw the Colour television and the music systems market boom beyond anyone’s imagination. This was further ‘authenticated’ by the entry of the Korean brands with their feature driven televisions into India. Philips the prolific innovator and the inventor was till then the undisputed leader in music systems and televisions… until the local and the Korean brands started gnawing at its heels. What started was a feature war in the televisions market, each wanting to outdo the other. Feature to feature, picture to picture! The Indian consumer started getting spoilt for choice. They started looking for the “Best Picture” and “Life-like picture quality”… or Digital Natural Motion for a smooth moving image. A little known fact about Philips is that it is the INVENTOR of the picture tube and also the colour picture tube amongst hundreds of other innovations which have made our live easier. 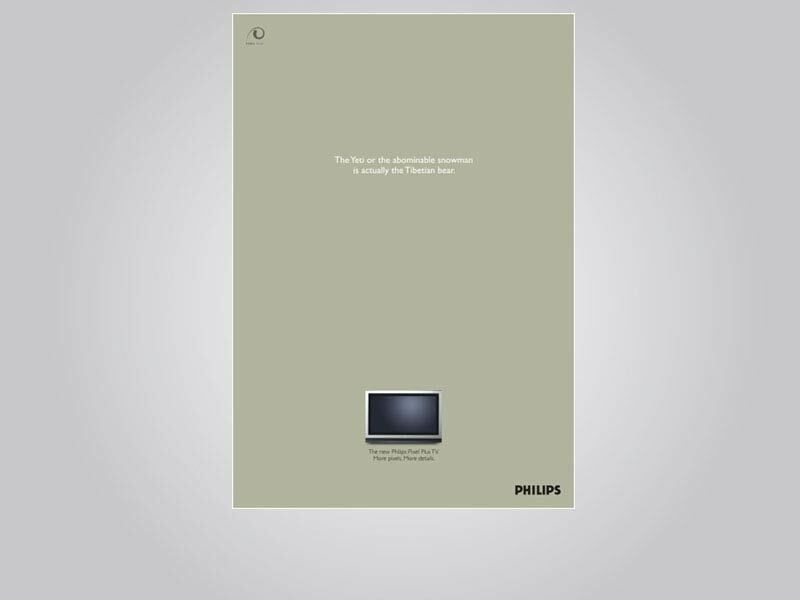 Then came the game changer from Philips for others to follow… the Pixel Plus Television. Here was a unique feature, for the first time it gave the viewers a smooth picture even when there was a moving image… The feature meant adding more frames in between a moving image to give it a smoother motion and remove the jerks, thereby allowing the viewer a smoother viewing experience. This was a first in the industry and yet again by Philips. Collateral was associated with Philips for a number of years right from their Black and White television days and had understood the brand very well. So when the Pixel Plus Televisions were launched, Collateral designed a campaign that took enhancing the details on a television screen to a different level. The four ad campaign took popular situations from around the world which were shrouded in a bit of mystery and used them perfectly. The idea was to highlight the mystery behind these situations such as the famous assassination of J.F. Kennedy, the US president, which has been under a cloud as there are speculation that there was more than one killer and hence over the time there was a popular saying about the ‘Grassy knoll’. Collateral took that tack and highlighted the fact that, had it been viewed on a Philips Pixel Plus television the viewer would have been able to see clearly another assassin with a rifle in the grassy knoll. Yet again, we highlighted the mystery of the Lock Ness monster mentioning that it was actually a fish called the Black Surgeon and yet another one mentioned that on a Philips Pixel Plus TV you could make out the Yeti was actually a Tibetian bear or 90% of UFO sightings would be proved as hoaxes only if the viewer had a Philips Pixel Plus TV. This campaign was entered for an award and sure enough, it won! Giving the brand Philips, product Pixel Plus TVs and the agency Collateral a lot of recognition.